After a decade of working in a call center as a Quality Analyst, I have decided it was time to quit. Last March 2016, I turned my back on the highly stressful graveyard shift, the commute at ungodly hours and the lack of sleep. 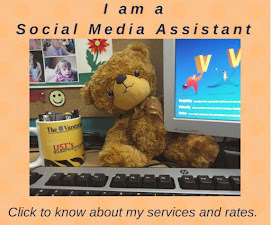 I am now a Work at Home Mom-Freelancer-Blogger-Virtual Assistant-Social Media Manager-Nanny all rolled into one. You may say, "Lucky you. You get to stay home and work." Hold your horses, people. 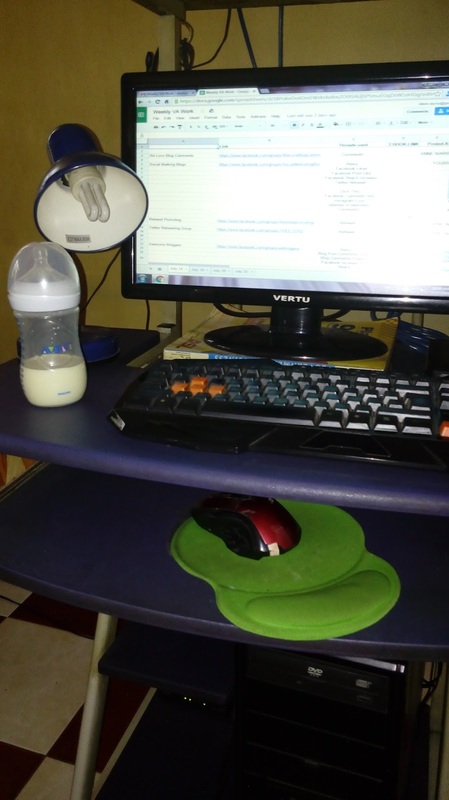 Working at home is not as easy as you think. Although I get to work in my pajamas and never have to worry about commuting, home based jobs can be as stressful as office based jobs. For you to be successful in this field, you have to be the Master of Multi-Tasking. 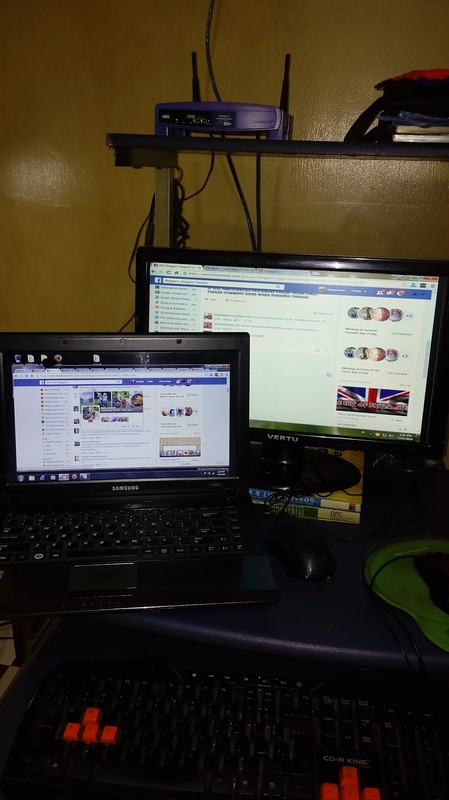 My work station at home. My daily tasks include taking care of my grandson from 7:00 am to 11:00 am; and from 6:00 pm to 10:30pm. So between the hours of 11:00 am to 4:00 pm, I focus on my online tasks, making sure that every assigned task is complete and error free. 4:00 pm to 6:00 pm is spent preparing dinner for the family. Nothing special. I am lucky my children are not picky eaters. From 10:30 pm till 1:00 am, I do my online writing assignments and update my blog. Bedtime for me is usually around 1:30 am. Doing my data entry job while my grandson is asleep in his crib. Saturdays are dedicated to household chores - doing laundry, cleaning the house, replacing bed sheets and pillow cases, and grocery shopping. As you have probably noticed, I only have one day a week for myself. How can I do all of these and not bog down due to stress? Well, here are some tips I can share with you. 1. Plan for the day ahead. Before going to bed at night, make sure all the stuff you need in the morning is ready. Fill the coffee maker, make sure the ingredients for a easy to make breakfast is thawed, sliced, and in the fridge. Sort the laundry and soak the whites if necessary. Nothing is more convenient than waking up in the morning and just flicking a switch. Hassle and stress free first thing in the morning is a great way to start the day. 2. Focus on the task at hand. Even if you are multi-tasking (doing the laundry while completing a social media chore thread), you must learn the "switch-on, switch off" technique. 3. Eat a healthy, well balanced diet. There are times that it is impossible for me to sit down at the dinner table to have lunch or dinner, and when this happens, I make myself a sandwich and have it while I am working on something. If I cannot have three full meals a day, I do a "Six small meals" a day plan. That would mean sandwiches, salads, a glass of milk, fruit, dairy or cereal. 4. Dedicate a few minutes a day for "me time." I usually sit on the couch, put my legs up on a stool and just close my eyes. I don't sleep or nap, I just try to shut my mind off things. It is very relaxing and I feel recharged and ready to accomplish more. 5. I take my rest day seriously. When I mean rest, I mean it. Sundays are when my sons take over the household chores and make meals for the family. I make them learn their ways in the kitchen. I know their future wives will thank me for it! 6. Lastly, I always remember to take my maintenance medication on schedule and of course, my vitamins. I take a multi-vitamin mineral supplement and 1-2 capsules of the non-acidic vitamin C supplement, FERN-C.
As we all know, multi-vitamin and mineral deficiency can lead to illness and we don't want that, especially if we are the bread winners in the family. Vitamin C is naturally found in most fruits and vegetables. However, we need to take supplements to fulfill the Recommended Dietary Allowance to reap its full benefits. The best benefit we can get from Vitamin C is an increased body resistance against infection and stress. It also acts as an anti-oxidant, thereby helping our body get rid of harmful free radicals. It has been shown to fight and prevent cancer, protect against cataracts, lower blood cholesterol and promotes cardiovascular health. Moreover, Vitamin C is known to speed up healing of wounds. Vitamin C preparations are either in the form of Ascorbic Acid or Sodium Ascorbate. As a consumer, we may not usually pay attention to this and purchase any available over the counter preparation. However, did you know that FERN-C (Sodium Ascorbate) is quickly absorbed than Ascorbic Acid? It is true. The low acidity of Fern-C makes absorption easier with less stomach irritation! So whether you're a blue collar, white collar or work at home professional, you can stay healthy and reduce stress by taking 1-2 capsules daily of FERN-C, the Number 1 Sodium Ascorbate preparation in the market today. Mabisa, Maaasahan at Subok Na! Make it a habit. I did and now I am more confident in meeting my work deadlines without the stress! I can achieve my dreams because I know Worklife ay Easy with FERN-C! Gusto mo ba maging milyonaryo? Simple lang, mag FERN-C para maiwasan ang stress at pagkapagod. Magbanat ng buto. Magdasal. Magtiwala. Stay happy, healthy and stress free while you workity with FERN-C! Geeze Your A Busy Mom You Seem To Do It All & Then Some; Great Job For All You Di In Such Little Time Your Tips Are A Great Help I Have To Learn How To Have ME Time Thank You! I need to check into FERN C. I also work from home and I need to take my rest more seriously now that school has started back. I was so exhausted all summer long. I'm going to try all of your tips to get back to being productive again. I know what you mean about having vitamin deficiencies. Right now mine is B12 and I'm trying to get that up to as normal as possible with vitamins. I rally don't want to take the shots. Not having the correct amount of vitamins in your body really makes it work over time. Not good when you are getting older. Thanks for sharing. Your life sounds a lot like mine. Although I do manage to go to bed at a decent hour, like 10:30 instead of 1:30. Its definitely not as easy as it may look or sound. These are great tips for making worklife easier and multi-tasking. I am really going to use these tips. The FERN-C I am going to have to check out for sure. We all could use something to keep illness away. Thanks for sharing the tips. This is fantastic, I am glad you are able to make work life easier, love how you balance and maintain what's important too! It isnt easy to work at home. It takes self discipline and dedication. This has got to be one the best posts I've read today - I'm all about making my work life easier!! I really love the way this all comes together! Thank you for sharing! These are awesome tips! Eating a healthy, well-balanced meal helps me stay focus at work and Sunday is my rest day too!